The eastern white pine in the photo will be cut down this week. The pine tree sits on the Park Mead North condominium property. When I asked Park Mead’s property manager, Westford Property Management, the reason for cutting down the tree, I was told that the removal of this standalone pine is due to the current weakness of the tree, probably accelerated by Merritt Village’s decision (the adjoining property owner) to remove all of their trees, which acted as a buffer or windshield that protected the eastern white pine in the past. When you remove a large number of trees to clear a site for construction, you expose the remaining trees to new conditions. Sudden increases in amounts of sunlight and wind will shock many of the remaining trees. Since the trees at the Merritt Village project have been cut down, our eastern white pine has been dropping large broken branches on our parking lot, and this led to the decision to cut it down. It will cost Park Mead Condominium Association over one thousand dollars to remove this tree, but more importantly we will be losing the health that that tree brought to the people and wildlife in our community and its aesthetic value. The recent forum on town buildings brought to mind the question: To what extent are we responsible for protecting the physical makeup of our town? Property owners have a right to cut down trees on their property, but if exercising those rights negatively impacts another’s property, what is to be done? Developers can cut down trees with impunity. It’s no secret that they would be against a town ordinance restricting tree removals on private properties. The Merritt Village project has led to the destruction of 10 to 20 mature trees and in all the press around the project, there has been no mention of the loss of these trees, but now there is. This letter raises an important point about the proper balance of private vs. public interests in our treatment of trees, which cool the earth, clean the air, shelter wildlife and form part of a larger ecosystem. Removing mature trees impacts more than just the land they occupy. A solution may reside in offsets or re-planting, but the value of mature trees is an asset of the town. Paying attention is the first step. The destruction of those beautiful trees at Merritt was a real travesty — including a huge gorgeous Japanese Maple, beautiful big oaks, apple tree and others — what a loss to New Canaan and now the last remaining “green tree” will be gone – a beautiful part of New Canaan totally ruined. The loss of the older trees that were on the Merritt property were discussed at 9+ Town Planning and Zoning meetings. The trees that were removed in many cases overhung the Park street neighbors who were happy to see them cut down to minimize the risk over their houses. Additionally, many of the trees mentioned were in the area that we will be installing town sidewalks. The planting plan which was also approved by the town has many more trees being replanted than were removed. 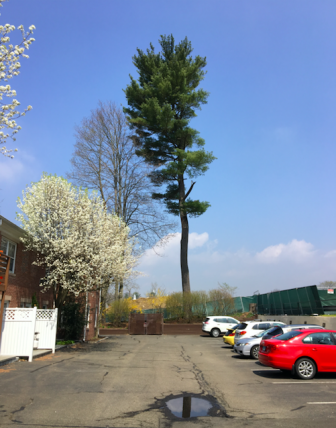 The reference to the “eastern pine” as shown by the photo is a Charlie Brown tree that was never maintained and is a hazard that should be taken down. If we suggested a cell tower that looked like the tree being taken down –there would be public outrage. This is neither a safe or a specimen tree that should even be in discussion. It is the right of a property owner to take down trees on their property as it is a property right. While the letter writer discusses the cost of taking down the lone pine tree, we as the neighbor are the ones paying for the removal of another tree on the Park Mead property because of the hazards it poses in overhanging our property. New Canaan is not short of trees but it is short of well maintained trees. The Japanese Maple referenced by one of the letter writer’s has actually been transplanted to another, safer place on the Merritt property. I would suggest that the letter writers should feel free to take an interest in the many other trees in New Canaan parks and public property as the Merritt property will be well planted and taken care of for years to come. I, as a tree hugger, have been allowed to review Arnold’s planting plans for Merritt Village and they look great to me. In fact, the whole place will look much better when it is completed than it did before. It should be noted that my wife and I are already on the reservation list for a place there! Today I discovered another mature tree that was recently cut along the same property boundary. That makes three mature trees on my property that had to be cut down because of what the Merritt Village project has done on the adjoining property: the Eastern White Pine, the tree that the developer paid to be cut down, and a third one. The developer paid his own money to cut down one of our trees, and he expects his neighbors to be grateful for this gesture. Keep your grubby money, I want our trees back. And the developer offers the same hackneyed justifications that prey on our fears: “there is a risk that the tree will fall on your house; there is a risk that it will fall on the wires; it is not a well-maintained tree; it is a hazard that should be cut down.“ The Merritt Village project is on Park Street which happens to be the road that most people use when they enter New Canaan. Parts of that road are tree-lined greatly enhancing the beauty of the town and making a good first impression. The Merritt Village project has removed several mature trees that were right on Park Street undoing the beauty once afforded by those trees and helping to change the character of the town from a tree-lined street town to a suburban sprawl town with bush-lined streets. New Canaan sits on the outer suburban ring of the New York Metropolitan area. The suburbs close to the city boundaries like Yonkers have had their mature trees removed long ago. Many people move to the outer suburban ring to live in a more bucolic setting and leave behind the suburban mess that developers made in the inner rings, but the developers follow us out here and make the same changes trying to sell it as a luxury and scaring us with images of trees crushing our homes. Some people that have followed the move to the outer suburban ring bring their inner ring mindsets and will cut down trees just because they drop too many leaves and acorns on their properties. These are not the kind of people we want making tree-removal decisions. The developer then states that neighbors were happy to see the trees cut down. I don’t think so. For someone who is making money supposedly improving our community the developer seems to be pretty out of touch with what makes our community happy. New Canaan is not short of developers, but it is short of thoughtful, considerate developers. Yonkers, the city with a population of more than a million people right next to NYC? Bit of a stretch. Have you looked at Yonkers on Google Earth? And then compared to New Canaan? The truth is we are living in a forest and trees go through a life cycle. We need to preserve trees, absolutely, but we also need to keep people and property safe. That sometimes means removing unhealthy trees. And yes, trees actually do crush homes and cars (happened to me last month). And yes, the neighbors across the street actually did thank us for removing the very large trees looming over their wires and their home. They were especially thankful when once removed they could see the rotten interiors. Twenty years ago a fallen tree during a storm tore out my home’s electrical service wire from the street pole and ignited a neighboring tree. Yes, this happens, and no, it’s not an anomaly. “These are not the kind of people we want making tree-removal decisions.” This implies that others should be doing that, which I presume means people like you, whatever that means, but I’m guessing it means people who won’t ever touch a tree? Very controversial to suggest others can dictate what other property owners can or can’t do with their own property. And a very slippery slope. “…..the developer seems to be pretty out of touch with what makes our community happy.” It’s important to realize that the original concept of Merritt Village actually came from the very people of New Canaan. We were approached by community residents who decried the lack of housing diversity, many of whom have been forced to leave as a result. MV is a response to that very need. New Canaan is not short of concerned citizens writing to news sources, just thoughtful, considerate ones. Arnold, you are correct. Grubby isn’t the most appropriate term. There are much more appropriate ones. Mr Sill—While I don’t know you, nor have I met you, nor have I seen your name in press before–that’s a rather harsh comment. 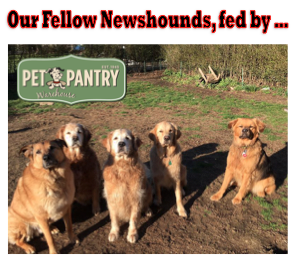 So enlighten the readers to what have you done for the Town of New Canaan or in the nonprofit world. The pictured Eastern White Pine you deride was cut down today (there is no species of tree called “Eastern Pine”). Our tree was over 50 feet tall, and had been there for decades before its immediate surroundings were denuded. It is disrespectful to refer to this tree as a “Charlie Brown” tree. This majestic species is the largest conifer in the Northeast, its tall, straight trunks prized for ship masts in the colonial period. This species is worthy enough to have been designated the state tree of Maine. We know the mature trees destroyed at the Merritt Village site will be replaced with a decorative “planting plan.” We can only hope this planting plan won’t include non-native trees and plants (destructive to the local ecosystem) with nocturnal uplighting (wasted energy and light pollution). Mr Karp, I do not see how my comment can be perceived as harsh. In fact I am pretty sure I didn’t say much of anything either positive or negative. Perhaps you are viewing my comment with your own filters. Lastly, I do not need to enlighten anyone with any explanation of who I am, what I have or have not done for New Canaan or any non-profit. I most certainly don’t owe you an explanation for anything. Good day sir.